I got back to Tennessee this morning at 6:30 AM. Oh man, was I tired. I went with my grandparents and since my grandma does not drive, my grandpa was sleepy and swerved a lot, so I took over and drove. I slept in till 4! Soo late. Anyway, I went to Daytona. The weather....was insane. I thought Tennessee was humid. Nope. It is extremely humid that it was hard to breathe! I curled my hair, but seriously after 10 minutes of walking, it completely uncurled. :o The weather would have been great without the humidity. With having been in Vegas a few weeks before, I totally prefer Vegas over Daytona any day. 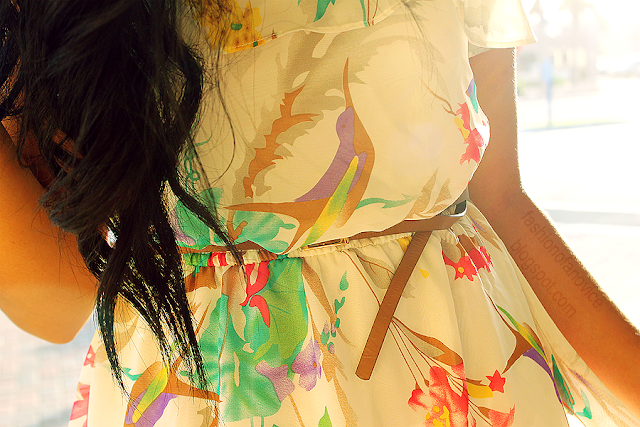 Here is a dress from Solilor that I decided to wear while there! It is a chiffon material, so it was a no brainer to wear it because it is light weight. And I love the colors on it! This dress is very pretty, the pattern is adorable! I am soooo in love with the print of your dress! Shame about the humidity, I'll be sure to keep that in mind if I ever get around to visiting!